The Apollo-CV Awards have been established with a view to identify product innovation, manufacturing superiority and implementation of best practices. To ensure that only merit ruled, the Award Jury consists of automotive specialists and reporters to judge the best in the class. A distinctive feature of these Awards is that apart from recognizing commercial vehicle and supplementary manufacturers, fleet operators too are acknowledged for their contribution to the industry. An external consultancy firm was involved for truthful assessment of all applications. 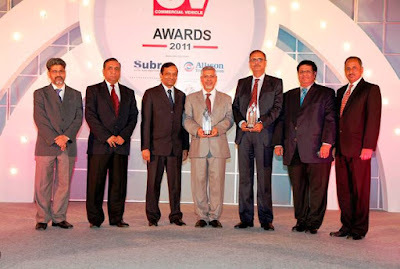 Mahindra Navistar has won the 2 Apollo Tyres-CV magazine awards: The coveted 'CV of the Year' & 'Heavy Truck of the Year'. OK will no longer be OK! Mahindra Navistar trucks are truly high performance trucks with special attention to outperform in toughest of conditions and are powered by the world-renowned MAXXFORCE® engines. The trucks are meeting the International Standards of Safety which protects the occupants in circumstances of accidents. The cabin is designed to provide comfortable journey for the driver.